There are a few things puppies have to learn at an early age. Aurora isn’t housetrained and cannot do any tricks, but we have taught her some behaviors for social and safety reasons. Puppies need to be held stomach up, getting cradled. This reinforces that the humans are the pack alphas… we get to have access to the soft spots. Puppies need to open their mouths wide when we say ,”Awwww!” This means if they put something dangerous in their mouths we can get it out without a struggle. Humans need to repeatedly touch the puppy paws and hold whatever part of the pup we want. Besides showing who is in charge, we want the dogs to be accustomed to being touched and petted. We want Aurora to like it when visitors touch her! But, enough for today. Happy Thanksgiving! 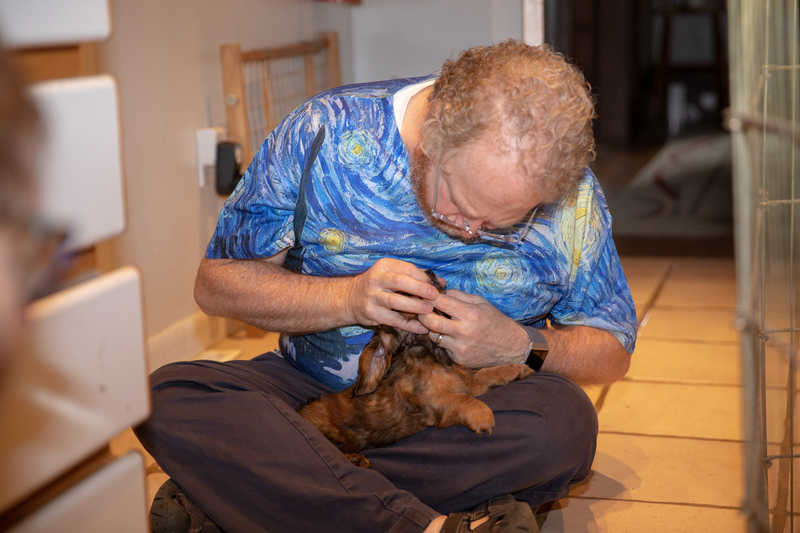 This entry was posted in dachshunds and tagged dachshunds, dog training, puppies2018, zenith puppies. Bookmark the permalink.